Following Maidan, last year’s impeccable the-revolution-is-live bulletin from Ukraine, Sergei Loznitsa returns to the found-footage format with which he first came to international prominence. The Event is in many respects a logical follow-up to Maidan, and attentive viewers will detect certain formal and ideological echoes. Centred on the military coup that represented the death rattle of the USSR, The Event is composed of footage from independent documentarians in the heart of what was Leningrad. As is Loznitsa’s method, we are witnessing seismic history from the street, and as with Maidan this means several things. First, we are thrust into the middle of the crowd, buffeted hither and thither, and this often makes it difficult to get our bearings. This is entirely intentional, and goes hand in hand with the second element of The Event: we are witnessing confusion in action. “Is Gorbachev dead?” “Why is the TV only showing the Bolshoi Ballet?” “We have to seal the records,” etc. The situation is one of constant change, even as the Soviet coup leaders try in vain to establish normalcy. Granted, we know how the story ends. 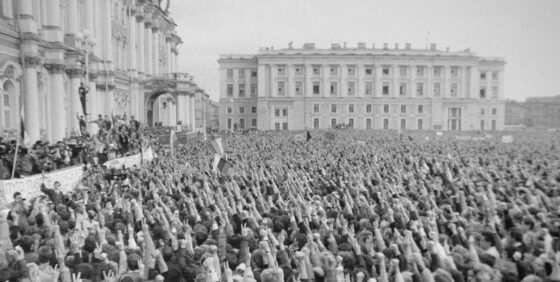 But Loznitsa’s editing and choice of material—passages separated by black leader and the main theme from Swan Lake—depicts both the chaos and the raw power of mass demonstration, people gathering in the street to demand their rights. Of course, The Event is also a prelude to a tragedy, since we all know (and Loznitsa knows we know) that the bold experiment in Russian democracy ends with oligarchs and Gazprom and Old You-Know-Who. But given that The Event is constructed as honest, humble heroism without a trace of irony, clearly Loznitsa is implying that it’s time to hit the streets again.